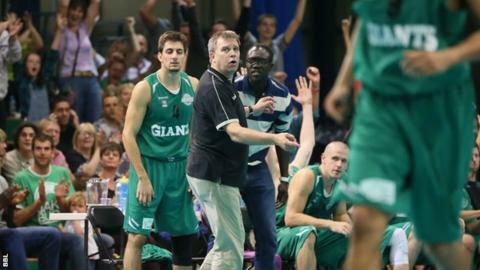 Manchester Giants moved up to fourth in the BBL Championship with a 102-77 victory over Plymouth Raiders. The hosts opened up a 14-point lead in the opening five minutes and eased to their third straight win, as Ingus Bankevics top scored with 20 points. "We got off to a great start and played our most consistent basketball on both ends of the floor of the season so far," said Giants coach Jeff Jones. There were also wins for Worcester and Newcastle, as well as Leeds' first. The Giants' victory at the Trafford Sportsdome was aided by the return of centre Mike Bernard from a back injury. "It was nice to have (centre) Mike back and that gave us that inside presence that will be so important for us to keep moving forward," added Jones. "Having him back we were really able to play two different styles during the game and take advantage of mismatches which I felt gave us an added edge." Reigning champions Newcastle Eagles maintained their edge at the top of the table, extending their own winning streak to seven by beating last year's runners-up, Sheffield Sharks 95-75. Sharks lost out on Saturday too, beaten 73-72 by Bristol, who themselves fell to Glasgow Rocks on Sunday. BBL newcomers Leeds Force grabbed their first league win at the expense of Surrey United. Worcester Wolves won a thriller against London Lions, following a third-quarter fight-back while Leicester Riders had to come from behind to beat Leeds and Cheshire Phoenix produced big plays in the key moments to rise above Durham Wildcats. In the WBBL, Siobhan Prior's 24 points powered Nottingham Wildcats to an 89-50 success in the battle of the last remaining unbeaten teams with Team Northumbria while Brixton Topcats recorded a historic first league win against Leeds Beckett University.